Kamek's Card Tricks is a Boss Battle minigame in Mario Party: Star Rush. It plays similarly to Deck Dry Bones from Mario Party 9. Players are shown cards, and are told to pick the card with the arrow facing down. Cards of up to three arrows can be shown, and the more arrows pointing downward mean more points hitting Kamek. However, Kamek can flip cards upside-down, reversing the direction of the arrows. Players can reach the maximum of 5 levels down only if they have multiple allies in the Toad Scramble mode. 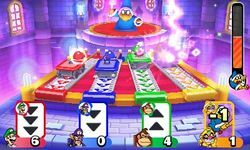 After the first round, a card is added with Kamek's icon on it. If players pick the card with Kamek's icon on it, Kamek attacks them, deducting one point. When half of Kamek's health is depleted, Kamek gets angry, adds more Kamek cards and reverses more cards. During this time, he can even swap a card's position with another card. Whoever deals the final blow to Kamek earns a bonus 3 points. In Toad Scramble, it reveals a Star upon defeat. On-screen (Before game starts) – "Pick a card with lots of ▼s!" This page was last edited on August 11, 2018, at 11:27.